I'll be honest I was really shocked that Target won! Their Up & Up 216ct is a mere 1.75 cents/wipe. What is interesting to me is that their 216ct is slightly cheaper than their 500ct at 1.80 cents/wipe. On a yearly basis it only adds up to be about $2, so you're safe buying them either way. Both Target's Up & Up Unscented and Scented 500ct packs are priced equally at 1.80 cents/wipe! 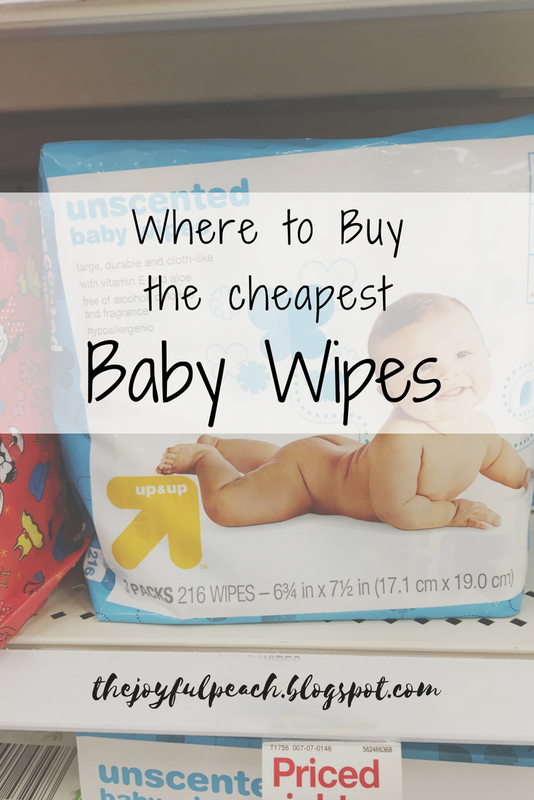 As I mentioned above the Unscented 500ct is slightly more expensive than the smaller pack, but when it comes to the Scented wipes, the 500ct comes in at 1.80 cents/wipe vs. 216 ct at 2.0 cents/wipe. 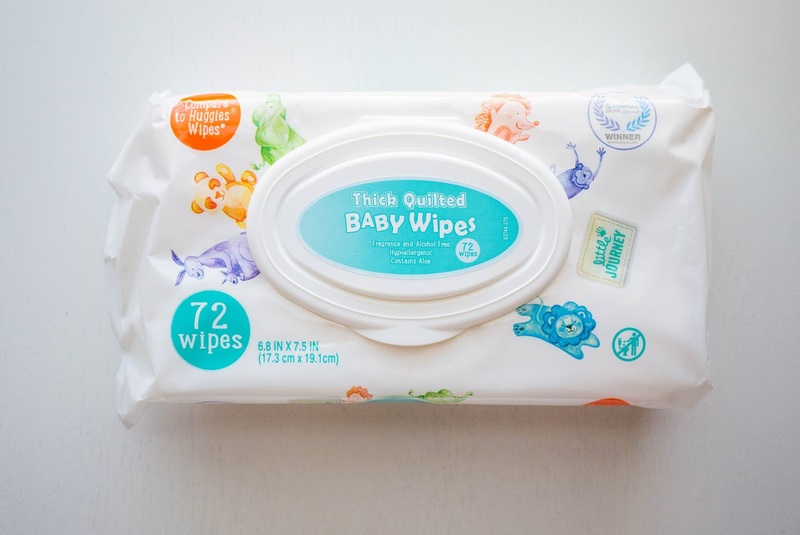 Aldi's Little Journey's brand came in third at 1.85 cents/wipe. I had never used this brand before I did this experiment but they ended up in the top 3, so I decided to give them a shot! 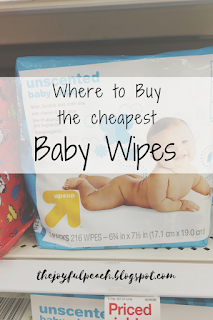 Pampers Sensitive 168ct wipes were the worst priced at 3.57 cents/wipe. Their 448ct was less at 2.59 cents/wipe but still ranked as one of the most expensive wipes. Now here is where buying in bulk will save you a lot of money! The Target Up & Up Sensitive 129ct is 3.33 cents/wipe while the Up & Up 460ct is 1.87 cents/wipe! That's a savings of $63/year when you buy the economy pack! My pick is Aldi's Little Journey's 216ct. Why not use the cheapest option you ask? We occasionally use Target's Up & Up Unscented wipes, but I'm not a huge fan of the quality because they aren't quilted. I feel like they don't clean quite as well and dry out a little quicker. I do keep a pack in our diaper bag just in case we're in a pinch though. At that price, they are perfect to keep as your "backup" wipes or to wipe down tables and high chairs at restaurants. Amazon ranked at 7/12 so after doing this experiment I immediately canceled my subscription. We were paying 2.31 cents/wipe from Amazon which may not seem like a lot but compared to Aldi's 1.85 cents for the same exact quality it adds up to a savings of $20/year! I don't know about you, but if someone is handing out 20 dollar bills I'm taking it! *Please note these prices are at my local stores. I highly encourage you to check your prices before you stock up!